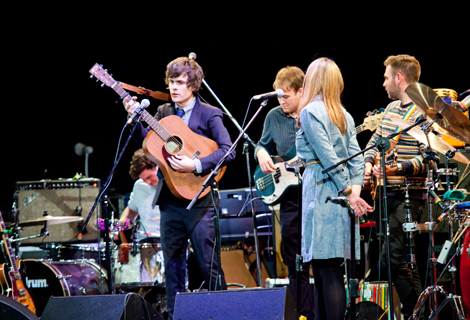 Liverpool Sound City 2012 literally ushers in a raft of singer-songwriters but as Getintothis’ Alan O’Hare suggests finely honed craft isn’t everything. Sssh. It’s Day Two and we’re at the new Epstein Theatre for some delicacy. People maybe on their phones, but Dead Cities are on stage. 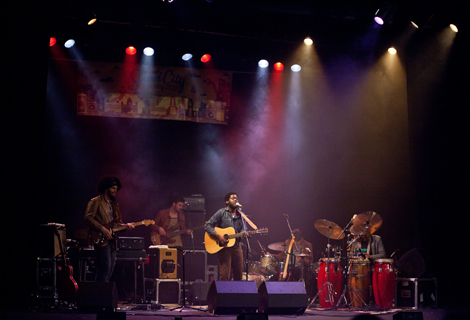 Great songs – but just acoustic guitar, bass and drums is not enough to lift them above the ordinary. Last year’s album launch at St Bride’s had invited guests bringing colour to their understated gems. And Dead Cities at Sound City are a band who need some colour. Thomas J Speight is next and once he’s as good as he thinks he is, we’ll all be on to a winner. Right now? 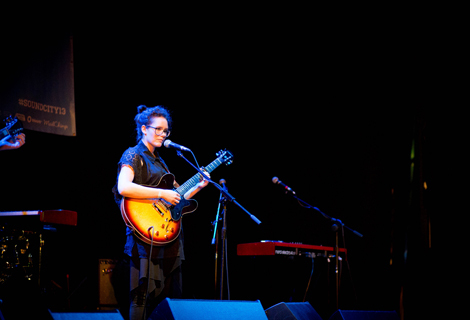 The Damien Rice-esque finger pickers and boy/girl duets need the intensity to bring the tunes to the level the confident youngster clearly believes he belongs at. Best song The River gives us all a Nick Drake moment and we head to the bar happy. Just as well, really. 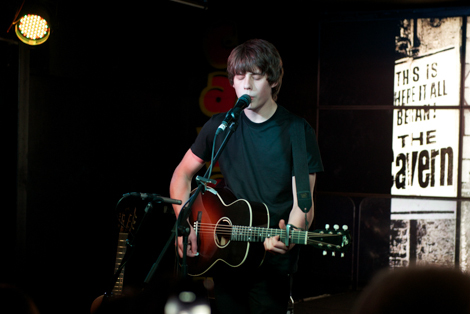 Nottingham’s Jake Bugg takes to the stage next and we’re all blown away. THIS is what Sound City is all about. 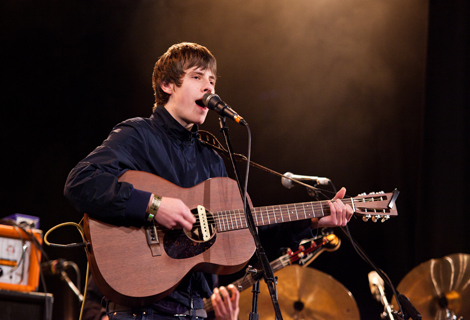 Acoustic guitar, drums and bass it may well be again… but Bugg has the intangible. The songs are ace, the playing immaculate and we’re in the presence of something. New single Lightning Bolt comes on like Alex Turner‘s Submarine soundtrack and that Scott Walker-esque croon echoes around the old building. The star of Sound City 2012 may have just strutted off stage like Dylan finishing It’s Alright, Ma. Yep, that good. 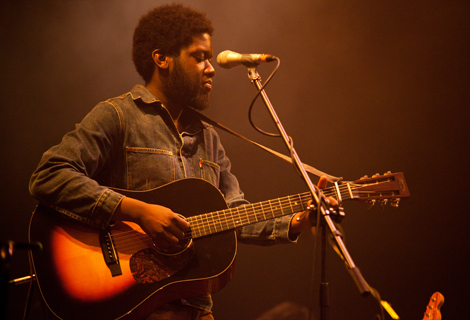 Headliner Michael Kiwanuka needs to raise his game then. He doesn’t. Well, not really. 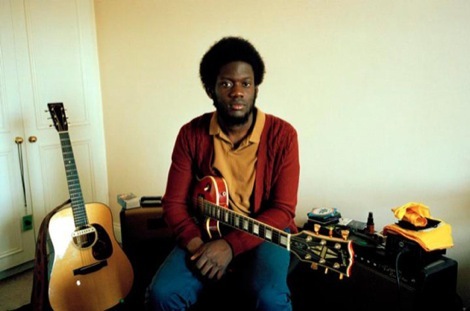 True, his band – with electric guitar flourishes, bass, drums, gorgeous Hammond organ and percussion – sound like the best Bill Withers record you’ve just found at Bold Street Oxfam, but Kiwanuka lacks a bit of stage craft. A very good gig could have been made great with a little TLC. As is, the singer just strums and, well, sings and we all hope it’s enough. The songs are the best crafted you’ll hear at Sound City and the music ebbs and flows like great soul music should but something is missing. Perhaps the sound is too delicate for a pissed up festival audience (stop talking at the back)? Whatever. when you close your eyes, it’s sublime and the beautiful Home Again sends us all home happy. Is quiet the new loud again? Not with today’s audiences. But the tunes are up there. Perhaps all these artists need to look harder to find the right crowd.